The Actor’s Charitable Theatre brings The Little Mermaid to the Bama Theatre in downtown Tuscaloosa June 1-4. Hundreds of children are expected to swim, bike, and run to the finish line at Lake Lurleen State Park on May 19. SIT BACK AND RELAX Looking for your next great read? Kick back with one of our summer reading suggestions. Legal: Druid City Living (DCL) is published monthly. Reproduction or use of graphical content without prior permission is prohibited. DCL is designed to inform the readers regarding community news and events. Information is gathered from sources that are considered reliable, however the accuracy is not guaranteed. All articles, photos, etc. submitted become the property of DCL. We reserve the right to edit as deemed necessary and are under no obligation to publish any material. Any inaccuracies should be brought to the attention of the editor. CORRECTIONS To report corrections and clarifications, email editor@ druidcitymedia.com In the April 2018 issue of Druid City Living, a caption inadvertently referred to the Blue Angels’ squad that “never fails to disappoint.” The caption should’ve read “never ceases to amaze.” We apologize for the error. As anyone who’s ever seen the Blue Angels knows, they are amazing! Lighting homes for more than 100 years. Lighting the way forward all along. When Alabama Power Company was founded on December 4, 1906, it was the beginning of more than a mere electric utility company. It marked the beginning of our mission to help transform Alabamaâ&#x20AC;&#x2122;s economy and vastly improve the quality of life for its citizens. Our continuing commitment to progress, innovation and economic development is one more way weâ&#x20AC;&#x2122;re helping elevate Alabama. Learn more at AlabamaPower.com. birthday celebration. We are going all out. I’ve hunted down what I need from Pinterest and Etsy, and we’ve even got real deal invitations. Initially, Beaux wanted a “tree cutter” birthday. After a quick online search, it occurred to me that while I can do lots of things, this wasn’t my cup of tea. And while my son is very well-informed when it comes to Kubota, construction equipment, and miscellaneous lawn care necessities, I had no idea what to do for a “tree cutter” party. I don’t even know what a tree cutter looks like. My ever-so-wise four-year-old little saw the panic-stricken look on my face and decided (for once) to take it easy on me. “Mama, we can do a camping party, too.” So, “Camp Beaux,” it is. And after several hours of watching YouTube videos and taking copious notes, plans for Camp Beaux were in full eﬀect. Beverages will include “bug juice” and “creek water.” There will be tents made from PVC piping and drop cloths. This is a DIY mom’s dream come true. Give Life to Your Story: Passion + Talent = Purpose By Abby Lee I spent years trying to ﬁgure out what I wanted to be when I grew up. Even as a grown-up, I still wasn’t sure I knew what I was supposed to be doing. I tried on many diﬀerent hats, but they just didn’t seem to ﬁt quite right. Only now, at 31, have I ﬁnally found the intersection of what I love to do and where I can use my strengths and talents. I could be mistaken for multiple persons if you follow me on social media: Allison the former Designer (my major at UA), Allison the Artist, Allison the Writer, Allison the Realtor. I wear many hats, and the desire to keep learning and evolving has never left me. I think I learned early to not lead a normal life. Who is normal anyway? Yes, you are excited to be ﬁnished with school, but keep learning. Be curious, my favorite oldest daughter. Seek to know more about everything. 2. Get ready to start all over. You’re past the minimum legal drinking age. And you’ve made it past the hurdles of college. Now, you’re embarking on a career. Guess what? You’re a freshman, all over again, on that career path. You’re at the bottom of the ladder once again. So, don’t expect to be lunching with the execs just yet. Work hard, and seize any opportunities that come your way. See step 1. 3. Respect your mama’s opinions. You don’t have to agree with them, though. You are 22, and you are engaged. So, read all the blogs, visit all the Pinterest boards, and make all the posts you want. Despite vowing to never become like my mother, I will probably interject my opinion here, as I have all your life. You don’t have to agree, or acquiesce, but I’ll always have them ready for you. And when you push back? Well, I’ll just remind you of all the pushing I did to get you out into this world. This world is huge. HUGE. When you go up in that plane, look down. We’re one of the four or six dots living in one of those tiny squares among the hundreds in the neighborhood, thousands in that town, and millions along those mountains and trenches you’re seeing as lights and earth. Don’t spend the majority of your life right here. Explore wherever (and whenever) you have the opportunity – so you can experience that your way may not be the only (or right) way of doing things. Think of the world as your classroom, your oﬃce, and your home. Remember us, your family, as you leave us behind to make your own – and nurture yours as God intended… with Him as the leader, your husband, and then your kids. Allison Adams is a mom of four and a Realtor with Lake Homes Realty serving Lake Tuscaloosa. For comments, email aadams@lakehomes.com. I know we’re your parents, but when you cleave… you are told to leave! Call it experience, call it a guess, either way, I wish you all the best. I am grateful. I am not losing a daughter – but gaining another son. And sappy as it is that it rhymes, I can’t think of a better one! What!? Dear daughter, did you not think I’d be gearing up for a big toast? Cheers to your independence... I’ll be there every step of the way! What about spring allergies? Dear Dr. Katy, So, I have the worst allergies in spring, with sneezing and itchy/watery eyes. Can my dog get spring allergies like me? Sneezy Dog Mama Dear Sneezy, Yes, dogs can have seasonal allergies too. However, dogs typically manifest their allergies in the skin. So, in dogs, more common symptoms would be an itchy dog. You might also notice your dog pawing at or shaking his ears, which may indicate an ear infection. Ear infections and itchy skin from allergies can become severe, and dogs may need medication to help control allergies and/or treat a potential secondary infection. These conditions should be diagnosed by your Veterinarian, and then they can determine if or what medication is needed. “I AM NOT A PERFECT PARENT. AND TO BE FRANK, I DO NOT BELIEVE IN THEIR EXISTENCE.” learn, and grow, is diﬀerent. Given the amount of societal issues and distractions and technological advances, I think most of us just try to do the best we can in giving our kids a shot at succeeding in the 21st century. Our Top 3 Tips Based On Our 25 Years Of Closet Installlation Experience) Are: 1. Watch out for hanger length. It is hard to keep your clothes neat, regardless of how expensive the finish on your closet system is, if your hangars are continually tangled. 2. Corners can be tricky. This is an area where it is easy to make a mistake in measuring. Make sure that anything that is going to stick out is not going to impede access to another area. Whether it is a pull out shelf, a shoe rack or hangers, make sure that there is room for it. 3. Measure, measure, measure. Measure the shelves, measure what needs to go on the shelves, measure how much room you need to move around. And then measure it again. Or you can call us. Our overall cost is typically only about 5 percent more than doing it yourself from a big box store. For example, 5% is $25 on an average job. Without the aggravation and time to learn how to do what we do expertly. GROWNUPS WERE STUNNED AS HE CHARMED THE SERVER INTO GIVING HIM ICE CREAM WITH SPRINKLES AND HOT FUDGE, ON THE HOUSE! and at Children’s of Alabama, we want to see every child grow up and live to their fullest potential. That’s why we recruit, train and retain the most inquiring minds, the most skilled hands and the most compassionate hearts in pediatric medicine. LET DR. MEMON GET RIGHT TO THE OF THE MATTER Have you been diagnosed with a heart rhythm problem called atrial fibrillation or afib? Many people have afib and feel tired despite taking medications and blood thinners for this problem. It doesn’t have to be that way. Dr. Nada Memon can help. She specializes in Cardiology and Electrophysiology, which means she’s an expert in the heart’s complex electrical system. She has been diagnosing and treating arrhythmias for almost 10 years. So why continue to be tired because your heart is out of rhythm. Call Dr. Memon at 205.759.6921. And let her get to the heart of the matter. Call 205.233.5183 for a free value assessment! April L. Stevens, LICSW, PIP, is a Licensed Independent Clinical Social Worker and counselor with Family Counseling Service in Tuscaloosa. Druid City Living Recommends … What does summer mean to you? Hot days soaking in cool swimming pools, or lounging at the lake house? Trips to the beach, toes in the sand as the sounds of the waves relax you into oblivion? For some of us, we look forward to reading. We’re often so busy that we can’t get through even one novel we’ve been itching to read. We’re hoping that this will help give you some ideas on which books might suit your fancy as you lie on those beaches and swim in those pools. An outstanding thriller. It has an old school, Rear Window kind of feel to it. You won’t be bored, and as events unfold, you’ll ﬁnd yourself staying up way past your bedtime to ﬁnish. It was billed as the ﬁrst big thriller of 2018 – and for me, it certainly lived up to it. Anna Fox is a memorable character, and the story has a big reveal you aren’t likely to see coming – even though I’ve just told you there’s a big reveal. A great drama that addresses some important themes – the haves and the have not’s, the relationships between mother and daughter, and social class. Ng is a gifted writer, and this book, unlike my other recommendation, unfolds more slowly and emotionally. Reese Witherspoon’s production company recently snatched this one up for a series, and given her stellar job with Big Little Lies, I am optimistic for the adaptation. Allow me to cheat a little and mention a hot new book I haven’t read yet – but can’t wait to: If you loved Tuscaloosa Moon and Tuscaloosa Boneyard, this seems like a sure bet. And also? She was kind enough to oﬀer up a few suggestions for some great summer reads. I’m a huge fan of travel-related books and great storytelling, and Deep South by Paul Theroux is a favorite. Theroux has a reputation for being sharp and curmudgeonly about the locations in his travels, but he seems to have fallen in love with the south, and Tuscaloosa, in particular. You have to read his wonderful account of meeting Tuscaloosa’s own Cynthia Burton (director of Community Service Programs of West Alabama, and star of this issue’s Photo of the Month). My top recommendation. For readers who like historical ﬁction, mystery, and sweet romance, A Girl Like You is a stellar novel set in 1930s Chicago. The author, Michelle Cox, is an award-winning writer who knows the history of her city and who spins a page-turning tale that includes some surprising twists along the way. Ms. Cox has also published her second in the series, A Ring of Truth, which is in my “to-read” stack now. Her third in the series is due out at the end of this month. Marketed as a novel for young adults, but I found it to be a delightful read, and I highly recommend it for all adults. This novel, set in 1932, features the famous quilting community of Gee’s Bend. The story is told through the life of the main character, a girl named Ludelphia Bennett, who must leave her very isolated community of Gee’s Bend, Alabama to seek help for her family. It is a story of courage, love, and the importance of family and home, coupled with Ms. Latham’s extraordinary research and understanding of time and place. Published by University Press in 2014, is a lovely collection of short stories. They feature female voices of all ages and backgrounds as they tell their stories about growing up and living in the South. This is a book I keep on my bookshelf and re-read at least once a year. There are always new aspects of this work to discover. These stories conﬁrm that Ms. Horne is a skilled author of prose as well as being Alabama’s current Poet Laureate. Jerry Roberts is a movie critic and movie fan who believes in Birth-Movies-Death. He is the historian for armchaircinema.com, armchairoscars.com, and he has a blog at overthinkingoscar.wordpress.com. Avengers: Inﬁnity War (April 27) It’s not a summer without 35 superheroes jockeying for screen time. In this nineteenth (NINTEETH!) entry in the Marvel Cinematic Universe, the Royal Rumble of super good guys try and ﬁght the all-mighty Thanos. Solo: A Star Wars Story (May 25) The ﬁrst Star Wars movie oﬀ the major timeline takes us back in time to tell us the origin story of the galaxy’s favorite scoundrel, as he ventures into the criminal underground and meets Chewbacca and future frenemy Lando Calrissian. Ocean’s 8 (June 8) The ﬁrst spinoﬀ oﬀ the popular Ocean’s Eleven series deals with an all-female crew featuring Sandra Bullock and Cate Blanchett, among others, pulling a heist at New York City’s star-studded annual Met Gala. Deadpool 2 (May 18) The Merc With the Mouth returns for more mirth, merriment, and murderous mayhem, this time on the wrong end of a time-traveling mutant soldier named Cable. Jurassic World: Fallen Kingdom (June 22) For this ﬁfth go-around, the message is still the same: Man is an idiot. After the downfall of the Jurassic World Theme Park, Owen Grady and Claire Dearing try to rescue the remaining dinosaurs from a volcanic eruption. The First Purge (July 4) If you love the Purge series thus far, then you were probably wondering what led to the 12 hours of crime per year and . . . here’s your answer. Incredibles 2 (June 15) Pixar’s long-overdue sequel rejoins the superfamily as Helen Parr/ Elastigirl goes out to ﬁght crime, leaving Bob Parr/Mr. Incredible home to care for their infant son Jack-Jack – whose budding superpowers prove to be a problem. Sicario: Day of the Soldado (June 29) This sequel to the hard-bitten 2015 drama deals with the CIA’s discovery that Mexican Drug Cartels are smuggling jihad terrorists across the border into the United States. Ant-Man and The Wasp (July 6) Global problems bubble up for the puny hero as he tries to balance his domestic responsibilities (he’s a new Dad) with his duties as Ant Man. Skyscraper (July 13) The Rock, a war veteran, lives in what is described conﬁdently as The Safest Skyscraper in the World, but there are a few bad guys willing to test that theory. Mamma Mia: Here We Go Again (July 20) It’s a sequel to 2008’s Mamma Mia! and this time, Samantha is pregnant and learns about her mother’s younger days. Mission: Impossible Fallout (July 27) A world of trouble awaits the MIF, as questions of their loyalties are brought to the surface when a mission goes bad. Christopher Robin (August 3) Winnie the Pooh’s human buddy is all grown-up and has left his imagination behind him. It’s up to our favorite Honey-lovin’ bear to help him ﬁnd it again. “WHEN A TEACHER BELIEVES IN A STUDENT, THE STUDENT LEARNS TO BELIEVE IN THEMSELVES – AND THEY’LL HAVE THE TOOLS THEY NEED TO BE SUCCESSFUL IN LIFE.” a year teaching, guiding, and shaping these young minds, and all their hard work has paid oﬀ. While their work is far from being over, they do get to take a step back and appreciate all the wins they had throughout the school year. ing their classrooms for a new group of students who will make up much of Tuscaloosa’s future. May 2018 18 COMMUNITY Sixth Annual Tuscaloosa Kids Triathlon to Benefit Secret Meals By Faith Henley The kids who choose to participate in the Tuscaloosa Kids Triathlon are making a huge impact on other children in need in the Tuscaloosa community. Hundreds of children are expected to swim, bike, and run to the ﬁnish line at Lake Lurleen State Park on May 19. The donations that participants raise beneﬁt Secret Meals for Hungry Children – a program created by Alabama Credit Union to provide meals for children who can’t access nutritional meals during the weekend, while they’re away from school. “We hope that through this triathlon, we can encourage our community’s youth to maintain an active lifestyle and help provide the ﬁnancial support needed to feed the children in our community who are faced with food insecurity during the weekends,” said Jasmine Wells, marketing assistant for Alabama Credit Union. The 6th Annual Tuscaloosa Kids Triathlon gets underway at 9 a.m. on the 19th. Kids will be encouraged to complete all three sections of a typical triathlon: swimming, biking, and running. Helpful devices, such as training wheels and ﬂotation devices, are allowed. The triathlon is open to children who will be between the ages of 5-16 as of Dec. 31. The race is sanctioned and regulated by USA Triathlon, making it a safe, positive environment for the young triathletes. To ensure the event stays beginner-friendly, the length of the race will vary depending on the normal skill set of each age group. Inexperienced participants had the chance to test their skills at the “Learn to Tri” training clinic, held last month. The children rotated through stations for each section of the race, and learned best practices, including how to transition. Started by Alabama Credit Union, Secret Meals for Hungry Children has fed thousands of children at risk for going hungry when public schools are closed. Research estimates 22 percent of children in the Alabama and Florida areas are living in poverty and don’t always have access to nutritional meals. “I believe that we are not only providing these children with nutritious weekend food packs, but to some of these children, we are delivering hope,” Wells said. “A hope that knows that this community truly cares about them, and that better things are coming their way.” Currently, the program serves over 2,300 of these children by discreetly slipping nutritional meals into their backpacks every Friday. Because of support from the local community, Alabama Credit Union has never had to turn down a request to add more children to the program, Wells said. “My favorite part about working with Secret Meals is knowing that I am doing a little bit each and every day to contribute to a cause greater than myself – childhood hunger.” To register for the 2018 Tuscaloosa Kids Triathlon, visit secretmeals.org. The registration fee is $45. The Tuscaloosa Kids Triathlon includes swimming, biking, and running. It’s open to children ages 5-16, and the goal is to encourage young people in the Tuscaloosa area to pursue healthy, active lifestyles. This year’s event will be held on May 19 at Lake Lurleen State Park. Tuscaloosa golfers – professionals and novices alike – are gearing up once again to support the mission of Tuscaloosa Youth for Christ. The group’s annual Legacy Golf Challenge will begin at noon on May 10 at the NorthRiver Yacht Club. “YFC is truly a special organization that is literally changing lives in our community and growing the kingdom of God with every relationship formed,” said David Ikard, a member of the YFC Board of Directors. “I’m honored and humbled to play a very small role in YFC.” The Legacy Challenge tournament ﬁnancially supports YFC’s mission through their year-round programs. Overall, YFC volunteers are able to reach over 2,200 middle and high schoolers in Tuscaloosa programs by meeting the students in their daily lives. Campus Life, the main program, sends volunteers to local schools to bond with students and help provide a positive inﬂuence. Volunteers are present in 16 schools in Tuscaloosa County, visiting during lunch, attending athletic events, and holding group events. YFC’s Parent Life program helps local women with the trials of motherhood at a young age. The goal is to provide encouragement, helping the women balance school with being a parent – which greatly increases the chance they will graduate. “Our club leaders go into the schools, meet these kids where they are in life, and let them know they are loved,” Ikard said. “Many of the kids YFC reaches have less-than-ideal home lives and are desperate for love, acceptance, and fruitful relationships. It’s the relationships that our club leaders and staﬀ are able to form with the kids that allows them to hear the Gospel and hopefully come to trust Christ in their daily lives.” Funds from the Legacy Golf Challenge will support the launch of YFC’s newest program – the Juvenile Justice Ministry. This new initiative allows YFC volunteers to bring their inﬂuence to incarcerated teens through relationships they build. As for who can participate in the upcoming tournament, organizers say anyone from the community with an interest in golf should ﬁnd some golﬁng partners and come support the cause. The tournament uses a four-ball scramble format, giving even the most inexperienced golfer a fair shot. Youth for Christ’s 2018 Legacy Golf Challenge is set for May 10 at NorthRiver Yacht Club. This year’s fundraising goal is $75,000. Druid City Living is the proud sponsor of the Legacy Golf Tournament Awards Presentation. Tuscaloosa YFC Executive Director Mike Green says this year’s goal of $75,000 would set an all-time record for the fundraiser. And what is the key to this tournament’s success? “We have about a dozen teams that play every year and whose ﬁnancial investment has grown as well,” Green said. “I think that is the case because we do a great job of hosting our golfers at NorthRiver and explaining to them how their investment is changing the lives of teenagers.” Ikard agrees, adding that it’s the experience of helping that makes this event so special. “To know I can play golf while simultaneously helping change kids’ lives; that’s a pretty rewarding round of golf, irrespective of my ﬁnal score,” he said. To learn more, or to sign up to play, contact Mike Green at mike@tuscaloosayfc.com. Become a sponsor at grouprev.com/ YFCLegacyChallenge. 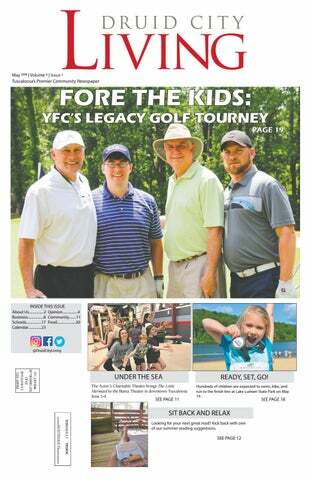 Group shot from front page: (L to R): Tim Lovett, Josh Watkins, Gary Phillips, and Chris Mitchell played as a team in the 2017 YFC Legacy Golf Challenge. 2002 44th Street East Tuscaloosa, Alabama 35405 (205) 657-7260 Elliott@Blackwarriorprotectivecoatings.com For your residential and business needs. Cook sausage in skillet until brown and crumbled. Drain and place in slow cooker. Take the can of whole tomatoes and crush them with your hands. Add the tomatoes and the juice to the slow cooker. Now, add the remaining ingredients, stir until combined well, cover, and cook on low for 6-8 hours. Serve over your favorite pasta. Chip Cake for my mom when she was little. It’s passed down, and now I’m passing it to all of you. It truly is the original Blondie dessert. Have fun in the kitchen this month, and as always, bon appétit! Amy Poore is a Tuscaloosa mom, wife, and foodie. To see more of Amy’s delicious recipes, visit her blog, Poore Amy, at pooreamy.com. Preheat oven to 350 degrees. Cream butter, shortening, and white sugar, and 1/2 cup brown sugar until light and ﬂuﬀy. Add egg yolks, water and 1/2 teaspoon vanilla, and mix well. Slowly add ﬂour until blended; dough will be stiﬀ. Lightly grease/ﬂour 9x13 inch pan and pat dough until level, sprinkle chocolate chips evenly, and lightly press into dough. Beat egg whites until stiﬀ, then slowly add one cup of brown sugar and 1/2 teaspoon of vanilla. Spread evenly over dough. Bake for 25 mins. Let cool completely before cutting. Did you know that Americans consume approximately 50 billion burgers a year? On top of that, the average American eats a hamburger three times a week! To be honest, I wouldn’t be surprised if the average T-town resident doesn’t beat this average, week to week. er options. But don’t fret my friends, I’m sharing a few of my favorite burgers this month – and next month – so you don’t feel too overwhelmed with burger goodness all at once. For a joint located right next to Bryant Denny Stadium, you’ve got to expect the food is going to be good. Trust me when I say it is worth the extra little bit to upgrade from the regular cheeseburger to a large cheeseburger. You didn’t think I was going to talk burgers without mentioning the Avenue Pub, did you? Who doesn’t love a burger served on a cutting board with an actual bucket of fries? The portions at Rama Jama’s are amazing, and the Alabama memorabilia in every nook and cranny of the restaurant just puts a little extra pep in your step. I can’t put my ﬁnger, or my taste buds, on what makes the burgers at the Avenue Pub so amazing, but it’s likely the freshness of the ingredients, and the innovation of burger ﬂavors that just work – all the time. The crinkle cut fries add even more magic to the handmade patty. If you needed more to convince you, live life to the fullest, and order the National Championship Burger – which features 17 ounces of double meat and cheese. The standard bacon burger on the Avenue Pub’s menu, featuring provolone cheese and your typical accompaniments, won’t let you down. An added bonus? How about the adorable $5 Happy Hour burger and some fries? This is a slightly smaller version of the monstrous, traditional bacon burger oﬀered throughout the week. Rama Jama’s is located at 1000 Paul W. Bryant Drive. The Avenue Pub is located at 405 23rd Avenue in downtown Tuscaloosa. Directly mailed to Tuscaloosa homes and businesses. 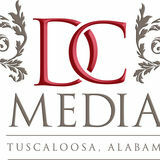 The most cost effective and complete way to reach Tuscaloosa with your business message. Chamber Business After Hours: May 1, 5-7 p.m. The District Room (551 20th Ave. Tuscaloosa). For more information, visit tuscaloosachamber.com. Author Rick Bragg at Tuscaloosa Public Library: May 1, 6 p.m. Tuscaloosa Public Library, Main Branch, Rotary Room. The Pulitzer Prize-winning author will discuss his books, tell stories, and answer questions at this free event. Alabama Booksmith be selling books for signing beginning at 5:30 p.m. For more information, visit Tuscaloosa-library.org. US Coast Guard Auxiliary Flotilla 8 5 Safe Boating Class: May 12, 8:30 a.m. Tuscaloosa County Courthouse Annex Auditorium (2501 7th St.) in downtown Tuscaloosa. Successful completion of this one-day class/ course, About Boating Safely, fulﬁls the requirements needed to obtain an Alabama Boater’s License, and may entitle you to a discount on your boat owner’s insurance. For more information, contact Lyn Spencer (205) 394-7808 or email lspencer44@comcast. net. Theatre Tuscaloosa Presents “Second Samuel”: May 18-27. Bean-Brown Theatre, Tuscaloosa. It’s the late 1940s in Second Samuel, a sleepy, South Georgia town where it’s hard to keep a secret, but everybody’s got one. When beloved music teacher Miss Gertrude passes away, will the town ever be normal again? For show times, or to purchase tickets, visit theatretusc.com or call the Theatre Tuscaloosa Box Oﬃce at (205) 391-2277. Jack Johnson: May 1, 7:30 p.m. Tuscaloosa Amphitheater. Tickets available via Ticketmaster.com. For more information, call the Tuscaloosa Amphitheater Box Oﬃce at (205) 248-5280. Kentuck Art Night: May 3, 5-8 p.m. Main Avenue, Northport. This event is free to the public. For more information, visit kentuck.org/art-night. Tuscaloosa Symphony Orchestra Run for the Roses Dinner and Silent Auction: May 3, 6:30 p.m. Dinah Washington Cultural Arts Center, downtown Tuscaloosa. Enjoy an evening of fabulous food, amazing auction items, and live chamber music performed by members of the Tuscaloosa Symphony Orchestra. For more information, and event passes, visit tsoonline.org. OLLI @UA Summer Kick-oﬀ Open House and Annual Meeting: May 9, 2-4 p.m. Bryant Conference Center, University of Alabama campus. Refreshments will be served and will include a brief review of accomplishments for the year, board elections, and on-site registration for summer courses. No registration is required, and the event is open to the public. For more information, contact the OLLI oﬃce at (205) 348-6482. Youth for Christ Legacy Golf Challenge: May 10, Noon-5 p.m. NorthRiver Yacht Club. Deliver Christ-sharing ministry to thousands of teens by ﬁelding a team or playing as an individual golfer. Business sponsorships are available. For more information, contact the YFC oﬃces at (205) 7523361. Mal Moore Memorial Golf Tournament: May 3-4, NorthRiver Golf Club, Tuscaloosa. This annual tournament, hosted by Greg and Regina Byrne, beneﬁts the Boys and Girls Clubs of West Alabama. The event also features a charity auction. For more information, visit malmooregolf. com. Five Horizons Health Services Presents “A Luau with Surfboards” Sunset Supper: May 10, 5:30-8:30 p.m. Tuscaloosa River Market. The Fourth Annual Sunset Supper features catering by Dotson’s Burger Spot. Beach wear is encouraged! For tickets, visit donatenow.networkforgood.org/ fhsunsetsupper. First Friday: May 4, 5-9 p.m. Art Walk in Downtown Tuscaloosa. This event is free and open to the public. For a list of galleries, maps, hours, and events, visit ﬁrstfridaytuscaloosa.com. 5th Annual Alabama Trade-O-Ree for Scouting Items: May 11, 2-11 p.m.; May 12, 8 a.m.-4 p.m. Five Points Baptist Church, Northport. Dealers of rare Scouting memorabilia will be on hand to buy, sell, trade, and appraise merchandise including uniforms, patches, and books. Silent auctions are held each day. Proceeds beneﬁt Scouting in West Alabama. For more information, contact Jon Hall at camper481@aol.com or (205) 799-5939. Alan Jackson and Riley Green: May 4, 7:30 p.m. Tuscaloosa Amphitheater. Tickets available via Ticketmaster.com. For more information, call the Tuscaloosa Amphitheater Box Oﬃce at (205) 248-5280. TSO Presents “Musical Brilliance – The Phenomenal Stewart Goodyear”: May 7, 7 p.m. Moody Music Building Concert Hall, Tuscaloosa. Stewart Goodyear, widely known as one of the greatest pianists of his generation, will perform Rachmaninoﬀ’s Piano Concerto No. 2. Other selections include Iberia by Debussy and Seven Studies on Themes of Paul Klee by Schuller. For more information and tickets, visit tsoonline.org. Calico Street Troupe Performances: May 12 and May 26, 10:30 a.m.-Noon, Northport Civic Center. This free, interactive, professional stage play for kids features costumed actors, dancers, special lighting, and music – all on a 36-foot stage. For upcoming show dates and times, visit calicostreet.com. Meals on Wheels delivers a midday meal to people who are homebound and/or unable to prepare meals for themselves. Meals on Wheels is a volunteer-based program (partially funded by the City of Tuscaloosa, the Federal Emergency Management Agency (FEMA), Emergency Food and Shelter Program (EFSP), and donations) that provides dignity, companionship and a sense of security for recipients, their families and caregivers. This program is administered in collaboration with area churches that assume responsibility for the program on weekends. Meals On Wheels serves a HOT meal Monday- Friday between 11 :30 am to 12:30 pm to those who are homebound and/or cannot prepare meals for themselves. Our meals are diabetic friendly and low in sodium. We do deliver to various parts of Tuscaloosa County there are some limits. There is cost of 4.50 for the meals and you are billed monthly also a monthly calendar (menu) is given to show what is being served. Volunteers Needed We do need volunteers who are willing to give up about an hour of their time to deliver we also accept groups (church, sororities and fraternities, group homes). Donations are always welcomed, we have so many people who are in desperate need of the program but are unable to pay and with limited funding every amount counts.